Safe Teen Driving Blog - Page 11 of 67 - Safe Teen Driving Blog - Providing a solid base for teen drivers by improving behavior, attitude, skills and experience. Question: I’m confused by the “left turn yield on green”. Who is supposed to turn first when the light turns green? Answer: I can see how this could be a little confusing for a new driver. This sign is most often posted where there is a combination of both a left turn arrow and a standard traffic light as in the photo above. It allows traffic to turn during those periods when the green turn arrow isn’t working. During normal or low traffic periods, the green left turn arrow won’t used at all. However, during times of heavier traffic, such as rush hours, the left turn arrow will be used along with the regular green light. The turn arrow will allow traffic in the left turn lanes to turn left. When the turn arrow turns red, the standard, round green light will light up allowing traffic in the right lanes to proceed. 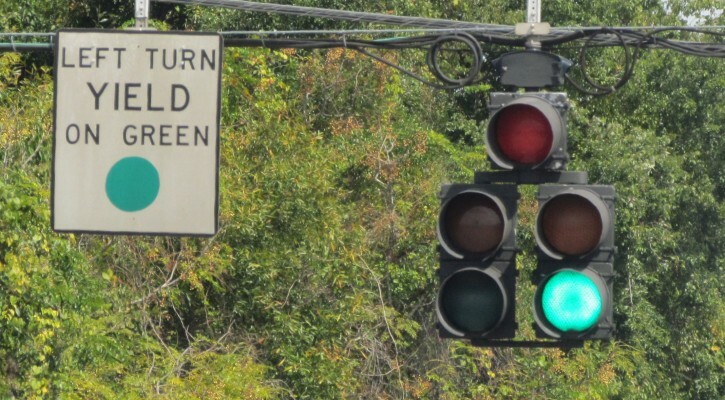 The sign, “left turn yield on green,” means that traffic in the left turn lane is allowed to turn but only if the oncoming lane is free of traffic. If you’re in the left turn lane facing a standard, round green light with the “left turn yield on green” sign posted, you must wait or “yield” until the opposite lane is clear or there is a wide enough gap in the oncoming traffic to give you enough clear space to make a turn. If the left turn arrow isn’t working and traffic is heavy in the other lane, you may have to wait through the red light until the next green light before traffic is light enough to allow you enough clear space to turn left. Another teen has died as the result of “car surfing.” The teen fell off the car and received multiple injuries including injuries to his head. He was taken to the hospital by his parents where he died the next day. If you aren’t familiar with car surfing, it involves standing on top of a car and trying to “surf” while the car is in motion. It seems like this idiotic practice just won’t go away. It’s a popular subject on Youtube. The problem with car surfing is that there’s no traction to maintain your footing and it’s almost impossible to maintain your balance. The law of physics that says “a body in motion tends to remain in motion” comes into play if the car turns even slightly or comes to a stop. 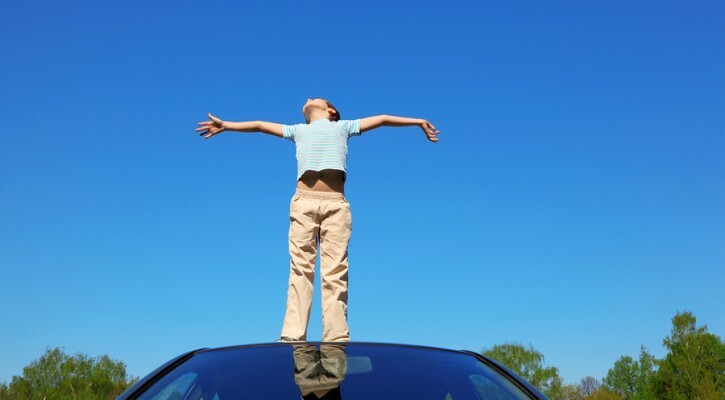 Given the relatively short distance from the roof of the car to the ground and the, hopefully, low speed, it may not seem like it would be too dangerous if you were to fall off. However, the low speed and distance are deceptive. Even at just 10 mph, a 140 lb teen boy whose head hits the pavement will strike the pavement with a force of more than 460 lbs. That’s more than enough force to cause serious brain trauma. The researchers found 99 reported incidents of car surfing, 58 percent of which were fatal. The average age of those injured or killed was 17.6, with males accounting for 70 percent of the victims. Three out of four car surfing deaths were caused by head trauma. Question: What is the two-second rule? Answer: The two-second rule is the rule most states have adopted to keep a safe following distance between your vehicle and the vehicle ahead. It’s the most simple way to know if you’re following another vehicle too closely or not. 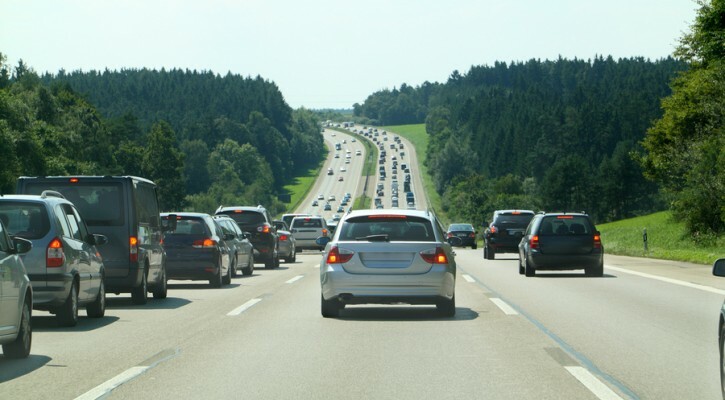 To keep a safe following distance, some older drivers were taught, and still hold to the rule, of keeping a distance of one car length for every 10 mph you’re traveling. In other words, if you’re traveling at 40 mph, you should keep a distance of at least four car lengths between you and the vehicle ahead. Some parents may still be teaching that rule to their teen driver but the rule doesn’t work very well. The main reason it doesn’t work is that it’s hard for most people to visually determine a car length. What exactly is a car length? Are you talking about a 1972 Ford station wagon or a VW Beetle? For those of us who may be math challenged, the math just gets too complicated. The two-second rule is much simpler. When the car ahead passes a line or a shadow in the road, start counting “one-thousand-one, one-thousand-two.” If you get to that spot in the road before you’re finished counting, you’re following too close. You need to back off a bit until you’re no less than two-seconds behind the vehicle ahead. The great thing about the two-second rule is that it works whether you’re traveling at 10 mph in rush hour traffic or at 70 mph on the interstate. Your reaction to an emergency ahead takes time. If the vehicle ahead should suddenly stop, it can take up to three-quarters of a second before you’re even aware that it has stopped. Then you need time to decide what to do; should you slam on the brakes or should you try to swerve into another lane to avoid it? If you want to move over into another lane, are there any other vehicles in the way? The decision-making process takes time. Once you have decided what to do, you have to put your plan into action. If you decide to slam on the brakes, you have to move your foot from the gas pedal over and fully depress the brake pedal and that takes even more time. Once you hit the brakes, it will still take time before your vehicle can come to a full stop. On average, it can take from up to one and a half seconds from the time the emergency starts until you fully react and put your escape plan into action. That’s known as the “reaction time.” One and a half seconds may not seem like a long time but remember, if you’re traveling at 40 mph, your vehicle will travel almost 60 feet in that amount of time. That’s a long way! When you add the distance after you hit the brakes until you come to a complete stop, you have the “total braking time.” The distance adds up! The two-second rule provides the minimum distance to give you enough time to react and take action if something should happen ahead. Three or more seconds is even better and some states require at least a three-second distance. If it’s raining or if you’re following behind a motorcycle, you should keep a four second distance. In the rain, the roads may be slippery and you need the extra distance in case your vehicle starts to skid. You need to keep a longer distance behind motorcycles because they can stop so much more quickly than a larger, heavier vehicle and you’ll need more distance to react if something happens ahead. Question: What are the rules for making a right turn on red? Answer: There are several rules and things that you must watch for when making a right turn on red. The first and most important rule – and this is the law in all 50 states – you must come to a complete stop at the red light before making a right turn on red. Failing to obey this law gets a lot of drivers in trouble either through involvement in a crash, or by receiving a ticket for running a red light. Many drivers, at intersections where red light cameras are installed, receive a ticket for running a red light because they seem to have forgotten this law and make a “rolling right on red.” Red means stop! Making a right turn on red isn’t allowed at every intersection. If a “No Right Turn On Red” sign is posted, it’s illegal to turn. Sometimes, when the oncoming lane has a left turn light, an electric “No Right On Red” sign will light up. It’s your duty as a driver to be aware of all signs. Other intersections may have a red right turn arrow. Just like a red light, a red right turn arrow means you must stop. 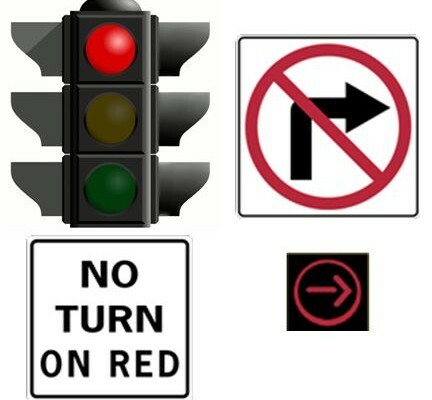 However, in some states, Florida included, it’s legal to turn right on a red arrow after you’ve come to a complete stop unless there’s another sign posted that says “No Right On Red.” If you’re unsure of what the law is in your state, check your driving manual or, to be safe, remain stopped until you get a green arrow. Pedestrians that may be in the crosswalk – they have the right-of-way. Vehicles coming from the left on a green light (including bicycles and motorcycles) – they have the right-of-way. Vehicles in the oncoming lane turning left on a green left turn arrow – they have the right-of-way. Vehicles from the right that are making a U-turn at the intersection – they have the right-of-way. Pedestrians and bicyclists entering the intersection from the right- they have the right-of-way. Another issue with right turns on red involves driver courtesy and good common sense. Sometimes, in heavy traffic, when traffic is backed up to the intersection, drivers must stop at the white line before entering the intersection to avoid blocking the intersection, if the light should change. Along with obeying the law, they are actually doing you a favor by keeping the intersection clear for you if your light should turn green. When you see a driver stop on a green light before entering the intersection, don’t take advantage of them by seeing that as an opportunity to make a right turn on red. It’s illegal, rude, and could lead to a road rage situation. You’re only allowed to turn right on red if the way is completely clear of all pedestrians and other traffic. Don’t allow yourself to get in the habit of a rolling right turn on red. Question: Are Graduated Driving Laws the same in every state? Answer: Most states have some form of Graduated Driving License (GDL) law but they aren’t all the same. Setting a minimum learner’s permit age of 16. Setting a minimum intermediate license age of 17. Requiring at least 70 required hours of supervised practice driving. A night driving restriction starting at 8 p.m. during the intermediate stage. A ban on all teen passengers. Many states ban other teen passengers for six months to a year because teen passengers can be very distracting and your chances of being involved in a crash are up to four times higher with another teen in the car. In addition to the above, many states also include a total ban on all cellphone use while driving. That the teen be at least 15 and one-half years of age before applying for a learner’s permit. Both classroom and behind the wheel driver training for anyone under the age of 18 before they can use their learner’s permit to drive on the open road. During the Learner’s permit phase, the teen must be accompanied by a licensed driver 25 years of age or older sitting in the front passenger seat. Receive at least 50 hours of supervised driving experience (10 at night) before being able to take the behind-the-wheel test. Once the teen has passed the behind-the-wheel test, he or she will be given a “Provisional License” allowing them to drive alone. During the first 12 months on a provisional license, the teen cannot drive alone between the hours of 11 p.m. and 5 a.m.
During the first 12 months on a provisional license, the teen cannot transport passengers under 20 years of age. Traffic violations during the provisional license period can result in suspension of the license until age 18. It is illegal for a minor to use a cell phone in any way while driving other than to call 911. Full driving privileges are not given until age 18. Must be at least 15 years of age to apply for a learner’s permit. Must hold their learner’s permit without any traffic violations for one year. During the Learner’s permit phase, the teen must be accompanied by a licensed driver 21 years of age or older sitting in the front passenger seat. Must receive at least 50 hours (10 at night) of driving instruction before applying for an operator’s permit. May not drive between 11 p.m.-6 a.m. for 16 year-olds and 1 a.m.-5 a.m. for 17 year-olds. That’s it! There are no other restrictions. As you can see, GDL laws are not the same in every state. However, as a teen, if you travel to another state, you’re subject to that state’s GDL laws so it’s a good idea to check out the GDL laws in the states that you may be traveling to. No matter what the laws in your state may be, you and your parents can choose to include all of the restrictions recommended by the IIHS in your “teen/parent driving contract”. As a teen, you may not be crazy about that idea but it’s for your own safety. Studies have shown that, in the states with the strictest GDL laws, the teen death rates have gone down significantly.